This track is a 30 minute, 1.8 km track overlooking the Roxburgh Dam. The land is owned by the dam operating company but an agreement with the Roxburgh Community Board allowed the formation of this interesting route. It features a shaded walk, elevated views, picnic tables, and plenty of schist rocks and trees. It is an easy walk and ideal for a family outing. 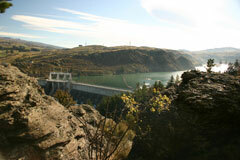 Start at the information kiosk located 1km downstream from the dam on the east side. From directly across the road the marked track starts and winds its way gently up through the trees to the first of two spectacular lookouts. High on the rocks, care should be taken and keep children behind the rails. There is interpretation here to fully explain the dam construction and what is now left. Return the way you came or for a 1 hour return walk, follow the signage to the Lake View Lookout. This loops back to the car park after rejoining the shorter walk track. One other option is a steeper, more demanding track that leads down the hill and back to the road. Schist rock bluffs are a feature of this walk and remains of a Chinese miner’s rock shelter will be passed. The conifers in this area were all planted after the dam construction but native species are regenerating as well. Walkers, mountain bikes, and dogs (on a lead) are the only users of this peaceful amble so go and enjoy.